CLICK HERE to listen to episode audio (3:56). All Web addresses mentioned were functional as of 7-14-17. From the Cumberland Gap to the Atlantic Ocean, this is Virginia Water Radio for the week of July 17, 2017. This week, we drop in on a group of people using the ancient Latin language to describe visible water hundreds or thousands of feet high. Sound highly suspect? Well, just have a listen for about 25 seconds. You’ve been listening to the 10 basic cloud types, according to the National Weather Service. Since 1802, cloud types have had names from five Latin language roots describing clouds’ appearance, location, or rain potential: cumulus, meaning heap; stratus, meaning strewn or layered; cirrus, meaning curl; altus, meaning high; and nimbus, meaning cloud in Latin but rain in English usage. Meteorologists classify the 10 basic cloud types you heard further into about 100 species or varieties, based on shape, appearance, and internal structure. Clouds form when water vapor molecules in the atmosphere condense into liquid droplets around particles of soil, salt, or other materials, called condensation nuclei. Condensation occurs simultaneouly with evaporation—the process that turns liquid water back into water vapor—so clouds form when, and where, temperatures are low enough that condensation exceeds evaporation. Cloud formation and type also depend on the amount of water in the air, air pressure, winds, and landscape features. The possibilities range in altitude from low, fair-weahter cumulus or rainy nimbostratus; to mid-level altocumulus or altostratus; to high, icy cirrus, or the tops of towering cumulonimbus thunderheads rising above 30,000 feet. At any height, clouds tell us about the atmosphere, using signals much older than Latin or any human language. Thanks to several Blacksburg friends for lending their voices to this episode. We close with some music suitable for a clouds conversation: “Storm,” by Torrin Hallett, a student at Oberlin College and Conservatory in Ohio. The cloud types call-out was recorded July 11, 2017, in Blacksburg, Va. Thanks to several Blacksburg friends for participating in this recording. The thunder sound was recorded in Blacksburg on April 20, 2015. “Storm,” a movement within “Au Naturale,” is copyright 2017 by Torrin Hallett, used with permission. Part of this piece was also used in Episode 362, 4-3-17, on hail. In 2017, Torrin is majoring in music composition, horn performance, and mathematics in the dual degree program at Oberlin College and Conservatory in Oberlin, Ohio. More information about Torrin is available at his Web site, http://www.torrinjhallett.com/. Cloud chart from the National Oceanic and Atmospheric Administration (NOAA)/National Weather Service (NWS) and the National Aeronautic and Space Agency (NASA), online at http://www.srh.weather.gov/srh/jetstream/clouds/cloudchart.html#myModall5. A Clouds Photo Sampler from Blacksburg, Va.
January 20, 2017, 4:30 p.m.
June 6, 2017, 7:20 a.m.
July 14, 2017, 3:30 p.m.
August 16, 2016, 6:30 p.m.
“Condensation is the process by which water vapor in the air is changed into liquid water. Condensation is crucial to the water cycle because it is responsible for the formation of clouds. These clouds may produce precipitation, which is the primary route for water to return to the Earth's surface within the water cycle. Condensation is the opposite of evaporation. “You don’t have to look at something as far away as a cloud to notice condensation, though. Condensation is responsible for ground-level fog; for your glasses fogging up when you go from a cold room to the outdoors on a hot, humid day; for the water that drips off the outside of your glass of iced tea; and for the water on the inside of the windows in your home on a cold day. The phase change that accompanies water as it moves between its vapor, liquid, and solid form is exhibited in the arrangement of water molecules. Water molecules in the vapor form are arranged more randomly than in liquid water. As condensation occurs and liquid water forms from the vapor, the water molecules become organized in a less random structure, which is less random than in vapor, and heat is released into the atmosphere as a result. David M. Ludlum et al., National Audubon Society Pocket Guide—Clouds and Storms, Alfred A. Knopf, Inc., New York, 1995. National Geographic Society, “Clouds,” online at http://www.nationalgeographic.com/science/earth/earths-atmosphere/clouds/. 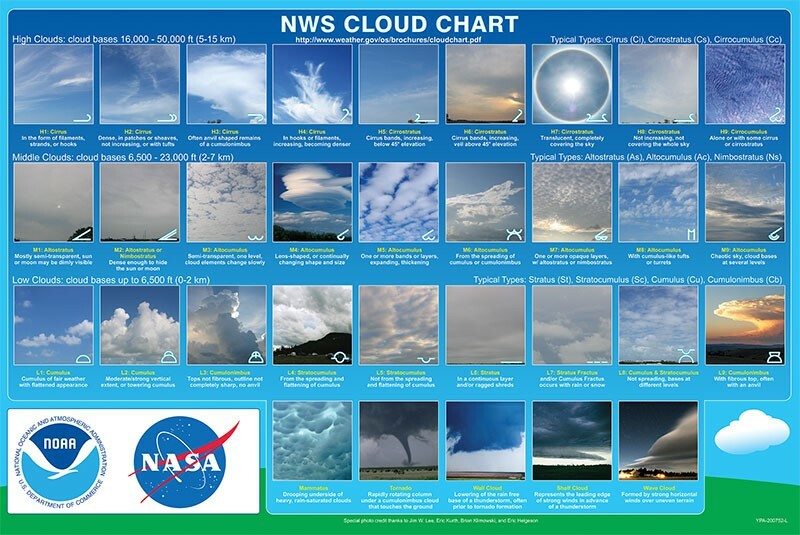 National Weather Service, “Cloud Chart,” online at http://www.srh.noaa.gov/srh/jetstream/clouds/cloudwise/chart.html; “How Clouds Form,” online at http://www.srh.noaa.gov/jetstream/clouds/cloudwise/learn.html; “Ten Basic Cloud Types,” online at http://www.srh.noaa.gov/jetstream/clouds/cloudwise/types.html. D.E. Pedgley, “Luke Howard and his Clouds,” Weather, Vol. 58, February 2003, pages 51-55. University Corporation for Atmospheric Research, Boulder, Colo., online at https://scied.ucar.edu/webweather/clouds/cloud-types. This Web site for cloud types includes photos and a 2 min./57 sec. video on cloud types (good for children). University of Illinois Department of Atmospheric Sciences, “Cloud Types—Common Cloud Classifications,” online at http://ww2010.atmos.uiuc.edu/(Gh)/guides/mtr/cld/cldtyp/home.rxml. U.S. Geological Survey, “Water Science School/Condensation—The Water Cycle,” online at https://water.usgs.gov/edu/watercyclecondensation.html. World Meteorological Organization, “Classifying Clouds,” online at https://public.wmo.int/en/WorldMetDay2017/classifying-clouds. Virginia Water Central News Grouper posts on news, events, and information resources relevant to weather are available online at https://vawatercentralnewsgrouper.wordpress.com/category/weather/. Winter precipitation – Episode 258, 3/23/15 (and water supplies); Episode 300, 1/25/16 (snow terms). 6.4 and 7.4 – meanings of unfamiliar words (a. word origins and derivations).